We are lucky to have such wonderful clients, and one who is no exception is Claire Kidd. She lives in Singapore and is a copywriter, originally from the UK. We met her through Gina Romero (see another blog we wrote about Gina here). 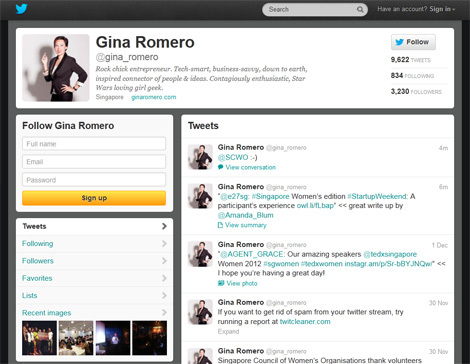 Want to see a great example of online personal branding? Meet Gina Romero! Gina Romero is an achiever, a visionary and a force. She has a special quality about her that attracts people and opportunities and creates magic. This can probably be listed as “charm” “charisma” “optimism” “self belief” “creativity” “a genuine interest in people and business.” but it’s more than that – it’s something unnameable so I will call it “The Gina Romero Factor”. A bit about our relationship with Gina. Launch of The Athena Network Singapore website – in record time! Whew! We made it! Two weeks ago we got an email from our client Gina, founder of Athena Singapore, saying they wanted Top Left Design to design and build a website for Athena in Singapore. We already have worked with Gina with clients in Singapore and there are a few more projects in the pipeline – the start of a strong global partnership! It was to be a WordPress based site and needed to be designed and built by the 24th – today – in time for their big launch event.